tonight, I was craving something chocolate. literal thought process: “I want something chocolaty. But I know I don’t have anything. I could get out of my PJs and grab something from the convenience store. Nah. Hmm, let me go to the kitchen and see what’s in my cabinet. Cocoa powder. (reads ingredients listed for chocolate cake) No milk. Hmm…(searches cabinet for more chocolate products. Finds Baker’s chocolate, the unsweetened little squares. Reads back of box. Recipe for Soft and Chewy Chocolate Drops.) Hmm…I seem to have all of these ingredients. Oh, wait…FOUR chocolate squares?! (dumps out contents of box) Oh, I have TWO. Easy! I’ll just cut the recipe in half. (re-reads recipe.) It calls for three eggs. Oh well, I’ll figure out what half an egg is.” Long story short…(weird expression, by the way.) I made the cookies on the back of the Baker’s box. Really easy and quick. I omitted the glaze, because I did not have any cool whip. 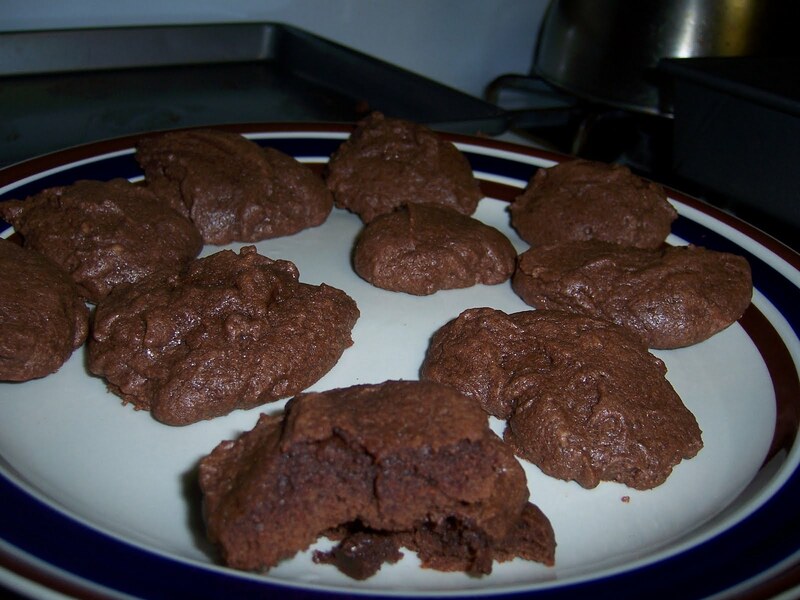 But no worries, these cookies are good with out it, and as the title of the recipe says, they are soft and chewy. Oh, and they took care of my chocolate craving, no problem. That’s it. Try not to eat all of them as soon as they come out of the oven. Just a little p.s/preview: tomorrow night’s baking adventure during movie night might be Better Than Brownie Cookies, Part 2, this time with peanut butter chips or butterscotch chips, instead of chocolate chips. Should be interesting, I like playing around with flavors. We’ll be bringing them to break-fast on Monday. That also means no post for Monday. Sorry, I am already not living up to my Monday/Thursday regular schedule. Oh well. Also, Friday night, or Saturday morning, we might be making pumpkin pie, or using the leftover pie filling for some dessert to share with the crew that is coming over for dinner on Saturday night. Keep coming back for more updates regarding these baking adventures!